I’ve been working on my Gertie-Coat muslin the past few evenings but finally got around to taking photos last night. I was only going to post them up on flickr, but thought you guys might want to see the muslins also. Muslin #1 was done in a regular cotton weight muslin that I generally use on my dress bodices and blouses. It’s totally not appropriate for a coat muslin, but I like to use it anyhow for a first pass to assess the basics like dart placement, bodice length, etc. Before I even cut out my muslin fabric, I made some alterations to the pattern piece based on taking some flat measurements. I reduced each of the front darts by 3/4″ (total), I reduced each of the back darts by 1/2″, shortened the sleeves by 3″, graded the side seams from a size 8 to a size 12 to give around 2.5″-3″ of positive ease, and I cut the rest of the seams using the size 6 lines. This cotton makes it quite hard to wear long sleeves (like a sweater underneath to assess fit better) so I’m just wearing a cotton t-shirt. Issues Found: Bust darts aren’t angled towards my umm, ya know…apex, drag lines on the sleeves starting at the shoulder, rotating inwards toward my wrists. I lifted up the collar so you could see the back in all of its wrinkliness. Issues: Bagginess at the lower back, same drag lines seen on the front at the arms/shoulders, and drag lines at the very top (indicate a possible tightness issue at my upper back near my neck). I’ve marked my actual shoulder bone with the pin, which is about 5/8 ths of an inch more forward than the pattern seam line is. (I’d even already let out the top arm/shoulder seam by 1/2″, total.) And then the sleeves are a bit too tight, especially without even wearing a sweater underneath. Lots of drag lines on the sleeves and on the bodice near the armpit. I don’t want to address the tightness of the sleeves or the draglines on the sleeves on the second muslin. I’m secretly hoping that by pulling the shoulder seam forward, it will have an effect on the sleeves which I can then better adjust. I’ve recently bought fabric and a pattern to make my first coat, and I have to say I’m rather scared of fitting it. I’ll be reading closely and picking up as many tips as I can! Yay! Thanks for following me through this. :) Once I get work on Muslin #3, I hope to be better about documenting the changes not only on the muslin but transfering that to the paper pattern. I’m wondering if you could help me out – with fitted skirts, I find drag lines over my bum that meet at the centre seam in a “V” shape. Does this mean the skirt is too small? Hey Neeno. Without seeing a skirt image, it’s hard to tell what kinds of lines you have at the bum, but it does sound like it may be too snug. But it could also be a grainline issue if the zipper is in the center back also. I just scanned through your blog real quick looking for an image but didn’t see one. Do you have a link you could send me of the said issue? I’d be happy to take a look and offer my 2 cents. I was able to fix the shell by extending the darts, quick fix though cos how the ines are back! And yes, the zippers are all centre zips. First of all that red dress is gorgeous! The drag lines with this dress, I believe, are from not enough ease at the booty. A quick fix for this would be to add a bit of ease at the side seams (the back only). You could also try to add a bit of ease at the center back area. The ‘right’ fix for this would be to do what is essentially a FBA (Full bust adjustment) but on your bum. This would have to be done before you cut out your fabric (in a muslin stage) so it takes more time. If I were you, I’d just try adding a bit more width at the side seams before doing a FBA since that is more time consuming and my require a few tries. a.) I’ve had a wavy zipper like this before, but it was caused by the fabric being too light for the zipper tape. I reinforce all of my zipper seams either with a strip of silk organza or I use some iron-on interfacing (cut on the same grain as the fabric at the center back opening) in order to prevent this. b.) The other time I had a wavy zipper like this was because the fabric at the back opening was not on the straight grain and was bias. Bias zippers insertions (with invisible zippers) are evil and I could never get the waves to go away. I’d double check this always!!! in the future in case that is what is happening. Just take your ruler and check that your center back seam is parallel with your grainline marking for your pattern. a.) 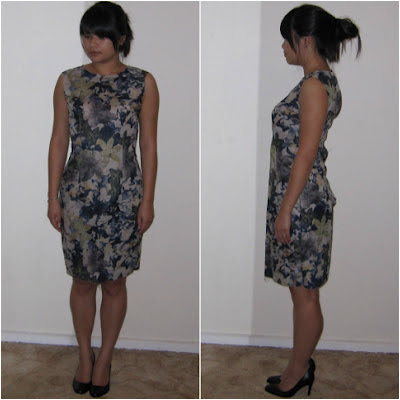 A sway-back is for curvy girls (or when the pattern doesn’t account for a large waist to hip ratio in the back). This would need to be done before cutting out your fabric, on a muslin. It’s essentially like taking a dart out at the waist to remove the excess fabric, but on the flat pattern piece. I’ve never done one, but there are a gazillion of bloggers who have so a quick google search should give you some pretty good examples and tutorials. Thank you sooooo much Liz!!! This has been great help!!!!! Would it help if I cut a larger size skirt to avoid all the FBA and adding extra SA on the back side seams?